In Atlantic Canada, for example, three level-3 Neonatal Intensive Care Units (NICU) provide human donor milk to infants under 1500 grams who are unable to receive sufficient milk from their own mothers. The milk is purchased at approximately $5 an ounce, including shipping, from the Northern Star Mothers Milk Bank in Calgary. Northern Star is a registered charity. Milk is collected from healthy volunteer lactating women across Canada who meet donor criteria. Donors may take some medications, but not pharmaceuticals or herbs to promote lactation. Donors ship the frozen milk by courier to Northern Star, where it is pasteurized and distributed to NICUs, inpatients and outpatients across the country according to need and availability. Since opening in 2012, Northern Star has distributed over 500,000 ounces (approximately 15 000 litres) of milk. Photo Credit: Martha Paynter, Guatemala City, April 20, 2017. The IWK Health Centre in Halifax has purchased roughly 120 litres per year of milk since 2013, however few women in Atlantic Canada donate to Northern Star. The lack of local donation may be attributed to perceived hurdles of the screening process and minimum 4.4 litres required for donation, or the preference among some mothers with excess supply to donate unpasteurized milk through peer-to-peer milk sharing networks. In contrast, a non-profit milk bank in Guatemala has adopted a starkly different model. 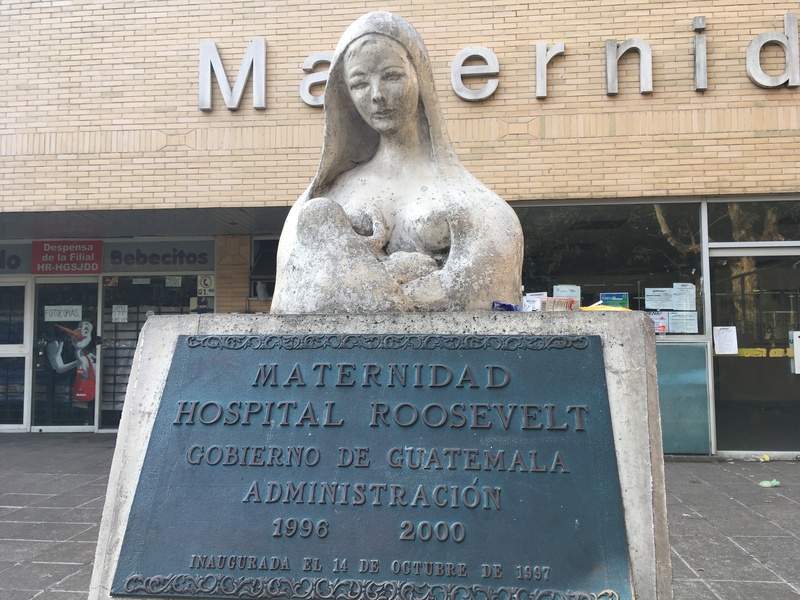 On April 28, I had the privilege of touring the Banco De Leche in the Roosevelt Hospital, the largest public hospital in Guatemala City. The milk bank comprises two rooms on the NICU floor, one for milk pumping, and one for processing. All NICU infants up to 33-weeks gestation receive donor milk. All their mothers are asked to contribute to the human donor milk program. Approximately 70% of mothers contribute. Every morning from Monday to Friday, lactating mothers with an infant in the NICU, who can get away from the responsibilities of home, work, and care for other children, arrive at the hospital. They change into pink shirts with lactation slits, and sit in rows in the pumping room. Up to twenty mothers can pump at a time, sharing nine functional electric pumps or pumping by hand. For many women, this is the only time they pump in a day, and for most the quantity expressed is low, a few millilitres. It may take up to a week for a woman to fill a 120-millilitre flask. Six nurses support the bank, instructing mothers in hygiene, pumping, the benefits of breast milk and labelling and tracking milk donations by hand. All mothers are provided with “ixbut”, a tea to promote lactation. Only after pumping, may mothers visit their infants. Regardless of whether their mothers participate in the program, all NICU infants receive pasteurized donor milk for seven feedings per day up to 20 millilitres per feeding, until they reach 33-weeks gestation or can tolerate preterm formula. Each infant may receive any mother’s milk. Mothers cannot breastfeed their infants directly, they must pump and the infants are fed by tube, cup or syringe. The Director of the Bank, Ana-Karen Celis-Hescht Mendoza, reports the Roosevelt hospital has a rate of necrotizing enterocolitis, a potentially lethal bowel infection to which premature infants are prone and for which human milk is protective, of less than 1%. The rate in Canada among very low birthweight infants is 5%. Unlike North American models, the system in Guatemala City reaches all NICU infants, has high rates of NICU mothers participating in donation, and achieves lower rates of necrotizing enterocolitis. Pasteurization of all pumped milk and distribution from a pool rather than mothers feeding their own infants raises questions about informed consent, family-centred care, and clinical effectiveness. The economic reality of once-a-day access to pumps at Roosevelt is suboptimal for building milk supply. Yet their model challenges our paradigm. How could we, in Atlantic Canada, normalize and support donation through space, equipment and resources in our hospitals and communities? How can we expand eligibility to donor milk and will it improve patient outcomes? How can milk banking become integrated into newborn care or the promotion of breastfeeding?